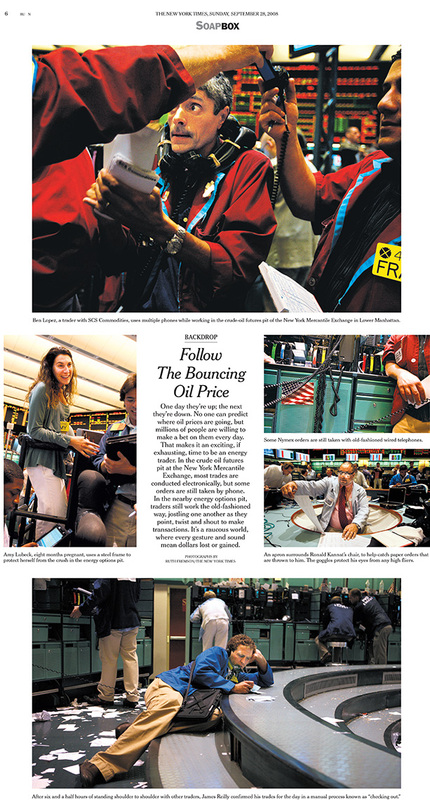 Photographer Ruth Fremson worked on a photo essay on the day's trading action in the crude oil futures pit at the New York Mercantile Exchange. It appeared as the monthly "Back Drop" photo essay column in the Sunday New York Times Business section. Story ideas were welcomed by photographers that chose to look at the business and finance angles of their subject. A day spent in Ruth Fremson's photographs appeared as the monthly "Back Drop" photo essay column in the Sunday New York Times Business section.